"I've gone from being a 16-year-old waitress to being a business owner and senior executive, and I couldn't have done that without my online network." Jess Ratty is a woman with a mission. She wants us all to get better at promoting ourselves professionally online - and creating our own career opportunities along the way. Given that changing jobs can be one of the hardest things we do, many of us might welcome anything that makes switching jobs easier. According to a survey by Hired, eight in 10 of us say we find changing jobs stressful - and more stressful than moving house, planning a wedding or even having root canal work. When it comes to job-hunting, Jess says the key is not to let your stress stop you from taking action: "Don't fret about things so much, or worry about how you might come across." It's something she has put into practice in her own career. 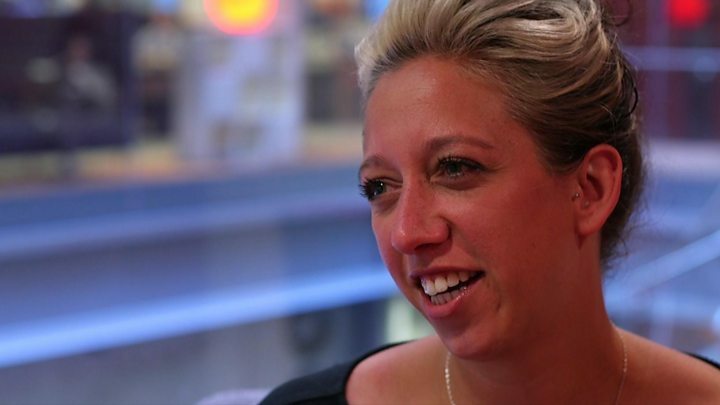 Now a senior executive at Crowdfunder, the UK's biggest crowd-funding platform which raises funds from small investors, Jess says she's come a long way since dropping out of school. She started work at the Eden Project in Cornwall as a waitress, and says it was her colleagues who helped her realise she "could maybe start achieving great things myself." So she set about creating an online professional profile as a shop window for herself - and says having an active online presence has been crucial for her career. "Crowdfunder found me through LinkedIn and went on to offer me a job." Crowdfunder's Dawn Bebe, who recruited Jess, says what's important for her when recruiting someone "is getting a sense of what they are like and what they are passionate about". Jess's experience is increasingly common, says Darain Faraz of LinkedIn. "A lot of the time, most people aren't looking for work, they are what we call passive candidates. But LinkedIn can help jobs look for you." Yet this only works if you have a complete profile, and sadly us Brits are not very good at self-promotion. We're more likely to share food pictures on our social media channels than our work successes or announcements of a new job. "People do make judgements based on our online profiles," says Darain. And be assured, recruiters will also check your Twitter activity and Facebook profile as well: "Make sure that how you position yourself online is how you want to be seen," he adds. "You don't want your Saturday night becoming your Monday morning." The mistake many of us make is to only use professional networking sites when we're looking for a new role, says Darain. But what recruiters want to see is a track record, so that they can judge whether or not we are right for a job. "One of the first things we do is check [online] for potential candidates in the right geographical area who have the skills and interests that we think would work for us," says Crowdfunder's Dawn Bebe. The jobs recruitment sector has changed markedly in the past few years, with a vast amount of job searching and head-hunting now done online with sites such as Monster, Reed, Viadeo and Xing. LinkedIn has about 400 million members worldwide (in the UK it has 20 million members - some 60% of Britain's working population and students) and last year Microsoft paid over $26bn (£18bn) for LinkedIn. Now Facebook, with more than a billion monthly active users, has launched Workplace; it's a platform designed to help workers talk to each other, in-house. Image caption Could Facebook come to challenge LinkedIn? While it is currently for use within firms, given Facebook's size it has the potential to be a serious rival to LinkedIn. Jess has her own tip for young professionals. "You need to be creative and inventive with your online profile if you want to stand out," she says. "You need to be consistent if you are using it to develop your career." Jess says she always wanted to make her career in her home county - Cornwall. Besides working for Crowdfunder, she and her partner have now set up the Cornwall Camper Company, hiring out restored VW campervans to holidaymakers. She points out that thanks to online networking sites, "you can make a big impact wherever you are". But she also has this important piece of advice. Merely being online is no substitute for professional knowledge and commitment, she cautions: "You've got to know your stuff."